One aspect of life in England I haven’t and will likely never grow accustomed to is winter. While I’ve never been able to put my finger on exactly what it is I loathe so much about these months on this landmass, I know I dread them with an intensity bordering on hysteria. But then I remember I live in a country with seventy or eighty varieties of commercially available potatoes. That’s opposed to the, if you’re lucky, five you’d find in an average American supermarket. My family still doesn’t believe me when I explain the half aisle in the grocery store dedicated to just potatoes. What does this have to do with winter? Comfort food. And potatoes are the epitome of that statement because, well, potatoes. This year has not been good on me and so I am already loathing this winter with a depth greater than any I’ve known in previous years, but potatoes. 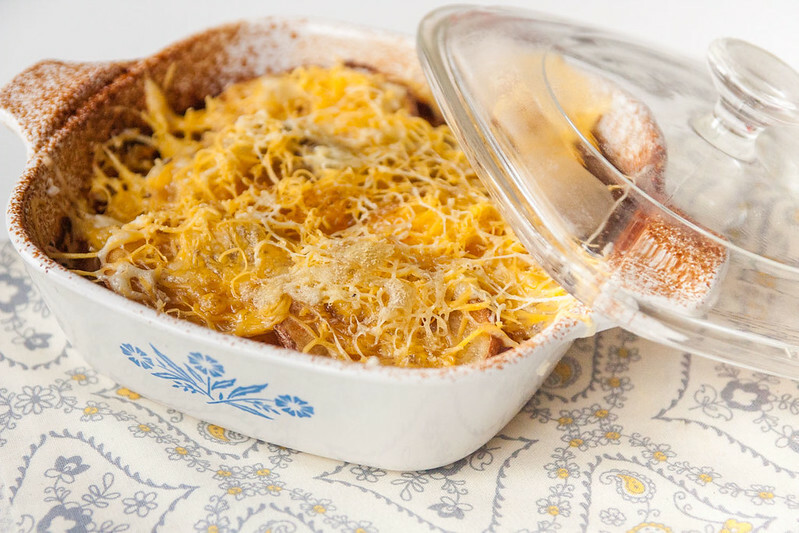 Boulangère potatoes are a gratin of thinly sliced onion and potato layers cooked slowly in stock, the less rich (but still packing a flavoursome punch) sibling of potatoes dauphinoise (which is made with lots of heavy cream) . The inspiration for this vegan potato recipe came to me after I realised it had been at least 6 hours since my last potato, and days since beer. Don’t forget to taste the broth for salt, and if the yeast extract (I use Meridian brand) is at all bitter, you can balance it with more salt and some sugar. Anyhow, I’ve got to pop to the shop – I’m out of potatoes. Preheat the oven to 175 degrees celcius (350 F). Whisk the beer, yeast extract, salt, and vegetable oil together in a saucepan over some heat – this is just to dissolve the yeast extract, so all you’re aiming for is a liquid without lumps. Add any extra salt, to taste. Slice the potatoes thinly, to 1/4 inch or smaller (make sure they’re uniform). You can peel the spuds first if you’d like, but I don’t bother. Arrange a layer of potato slices in the bottom of a small rectangular casserole dish (or whatever it’ll fit in, to be honest), followed by a layer of onion. Repeat (just make sure the final layer is overlapping potatoes). Pour the liquid over the contents of the casserole and bake on the top shelf for 45 minutes. Remove the potatoes from the oven and sprinkle with the grated vegan cheese. Return to the oven for 10-15 minutes, or until the cheese has melted and is beginning to bubble and brown. Which potatoes do you recommend for this recipe? Hmm, I’ve had a tough year too and also dislike winter, or the evil cold time as it is better known. But I had not considered the comfort of potatoes. Thanks for the tip! Potatoes are the greatest! They cure my self pity every time, without fail. I have always had a serious soft spot for mashed potato. This looks sooo good! I love warming winter food! As for your winter blues, I find wearing leggings under jeans makes me feel lovely and snug when the weather is really cold! Thank you 🙂 and I’m alllllll about the layers! Pretty much all I can think about! Oh man I hate beer and cheese but I want that. If anyone could make me like beer and cheese it’s youuu.